Meghna Srivastava got 99.8 per cent marks, with 99 in English (Core) and 100/100 in other subjects -- Psychology, History, Geography and Economics. 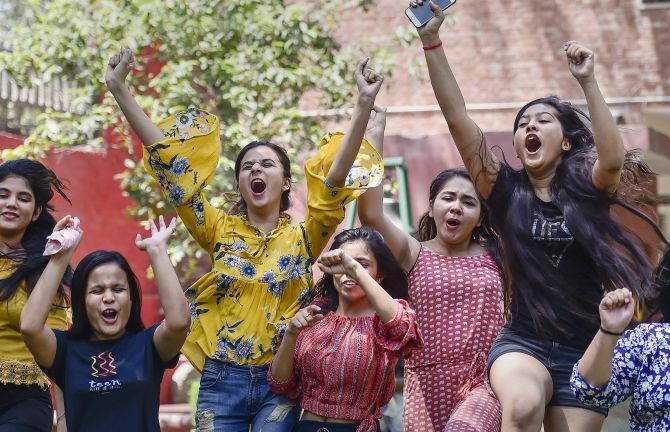 Girls outshone boys in the Central Board of Secondary Education Class 12 results announced on Saturday with Noida girl Meghna Srivastava, topping the examination this year. The overall pass percentage was 83.01 per cent as against last year's 82.02 per cent. Girls did better than boys with a pass percentage of 88.31 per cent against boys' 78.99 per cent, officials at the CBSE headquarters said in New Delhi. Human Resource Development Minister Prakash Javadekar congratulated those who passed the CBSE class 12 exam and also advised those who did not do well not to lose heart. He also said the quality of government schools is improving and congratulated those for a good show. Meghna Srivastava topped the CBSE Class 12 examination getting 99.8 per cent. She secured 499 marks out of 500. She is a student of Step By Step School, Noida, and is from the Humanities stream. She scored 99 in English (Core), while in other subjects --Psychology, History, Geography and Economics -- she scored 100. Srivastava said there was no secret formula for her success and it was only consistent hard work that had paid off. "It's been a really thrilling experience. There is no secret and one has to work hard throughout the year," she told reporters. Srivastava is the niece of former Central Bureau of Investigation director Anil Sinha, who said that she has always been a bright student. "She has always been a very bright and studious girl. She has brought laurels to our family and we are proud of her," Sinha said. The second position was bagged by another girl, Anoushka Chandra, also a humanities stream student from a school in Ghaziabad. She got 498 marks out of 500. She scored 98 in English (Core) and 100 in History, Economics, Political science and Psychology. Chandra thanked her parents and her school principal for her success. "I am very happy. It's an overwhelming moment. I want to thank my parents and school," she told reporters. The third position was held by seven students, including five girls, who got 497 marks out of 500, the officials said. The best performing region was Trivandrum in Kerala with a pass percentage of 97.32 per cent. Chennai region's pass percentage was second best at 93.87 per cent. Delhi was at the third spot with 89 per cent pass percentage, the officials said. Among different categories of schools affiliated to the CBSE, Kendriya Vidyalayas gave the best results with a pass percentage of 97.78, as opposed to 95.86 last year while private schools had the lowest pass percentage with 82.50. A total of 12,737 candidates scored 95 per cent or above, whereas 72,599 candidates scored 90 per cent and above in the exam, the officials said. The overall pass percentage of differently-abled candidates was 87.52 per cent. The topper among in differently-abled students category was Vijay Ganesh from Palakkad, Kerala, securing 98.4 per cent. 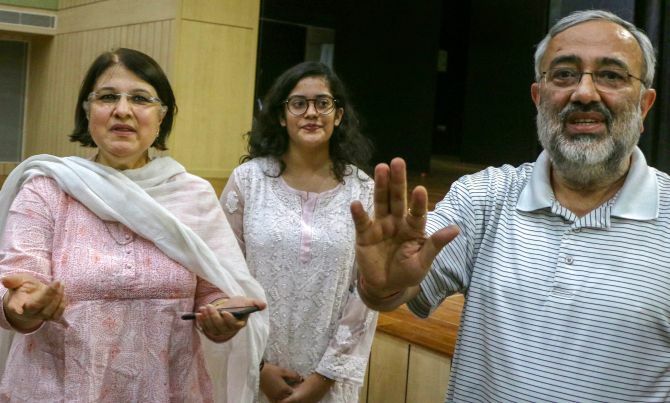 Pooja Kumari, from Dehradun, was second among the differently-abled students with 97.8 per cent, while Lavanya Jha of DPS R K Puram came third with 97.4 per cent. Jha says she did not let partial visual impairment bog her down and come in the way of her aspirations. For her, preparation for the examination began two years ago when she shifted to Delhi from Patna. "I left my parents and my home. I stayed in a hostel. The course I wanted to pursue was not available in Patna and that's why I had to move to Delhi for my Class 11 and 12," Jha told PTI. Jha said she also gave up watching television to focus on her examination. "I gave up TV. I used to enjoy watching songs. I don't think I like watching TV any more now," she said. The DPS R K Puram student is 40 per cent visually impaired and her impairment was diagnosed in 2014. "I did not let it affect me. I thought it would be better if I did not pay much heed to it. I ignored it and did not consider it as a hindrance," she said. "I got extra time to write my exams and and the question papers had a larger font. Even in school, I used to get extra time," she said. Jha said that she used to study for three-four hours for her exams. She now intends to pursue Psychology (Hons) from Lady Shri Ram College. The student from Delhi Public School said the feeling of being among the toppers has not sunk in yet. "I have been giving interviews and it's been tiring. But I am happy," she said. Jha's father works as a compliance officer with a private bank in Patna, while her mother is a homemaker. A total of 141 candidates in the differently abled category scored 90 per cent and above marks. Twenty-five candidates in the category scored 95 per cent and above. The overall pass percentage of the Delhi region saw an increase from 88.37 per cent in 2017 to 89 per cent this year. Pass percentage of candidates in foreign schools this year stood at 94.94 per cent as opposed to last year's 92.02 per cent. Number of candidates placed in compartment was 91,818. Javadekar and Education Secretary Anil Swarup had words of encouragement for the students who did not fare well in the exams. Swarup said that failures are stepping stones to success and should not bog one down. 'Results are a function of your effort. If you have put in that effort you will not fail. One failure doesn't mean that you have failed. Every accomplished individual has failed on more occasions than one before succeeding. For them failures were stepping stones to success,' he posted on Twitter. A candidate failing in one of the five subjects of external examination shall be placed in compartment in that subject provided he or she qualifies in all the subjects of internal assessment. The candidate would have to appear in the compartmental examination later. The board had conducted a re-test of Class 12 economics paper on April 25, nearly a month after it was leaked triggering widespread outrage and confusion among students across the country. The CBSE also operationalised a helpline for students to battle post-result stress. "The CBSE has also set up special counselling facility for dealing with post-result anxiety. There are 69 counsellors, principals and special educators, who will be assisting the caller on any issue pertaining to post-exam anxiety," said Rama Sharma, senior public relations officer, CBSE. Out of the 69 counsellors, 49 are in India, including two special educators, while 20 experts are located in Nepal, Kingdom of Saudi Arabia (Al-Khobar, Jeddah), Oman, the UAE (Dubai, Sharjah, RasAl-Khaimah), Kuwait, Singapore and Qatar. The helpline will be functional from 8 am to 10 pm on all days till June 9. The CBSE will be providing counselling services to students and parents to overcome common psychological problems and general queries related to Class 10 and 12 results, the board said. There were other messages too which asked the students to not indulge in criticism or comparison. '#CBSE Exam Results: Good news is that many students do better after school because of maturity and greater focus, increased awareness level and exposure to options. Avoid criticising or comparing with others. Be realistic. Remember, exams are not the end of the world,' the board tweeted. In another message, the board asked the students to be positive and look forward to the future. '#Be Positive #CBSE Exam Results Counselling: Examination Results are a spring board to future achievements, better prospects and scope for improvement. Whatever be the result, you have done your best. Now prepare for your future,' another tweet said.